It’s still early but “In the Middle, Somewhat Elevated (to Forsythe and Willems)” might be the best new local artwork of the year. The light installation by D.C. artist Tommy Boboreads like a painting. Motion-controlled bulbs installed along a wall project light across a sequence of little square mirrors that bend and scatter the colors in kaleidoscopic combinations. The piece is mesmerizing, an array of one tight abstraction after another. Or maybe the highlight for 2018 is “The Calm in the Day, Saved for the Moment (R-GB Arrangement),” an even simpler arrangement by Bobo. This one’s static. 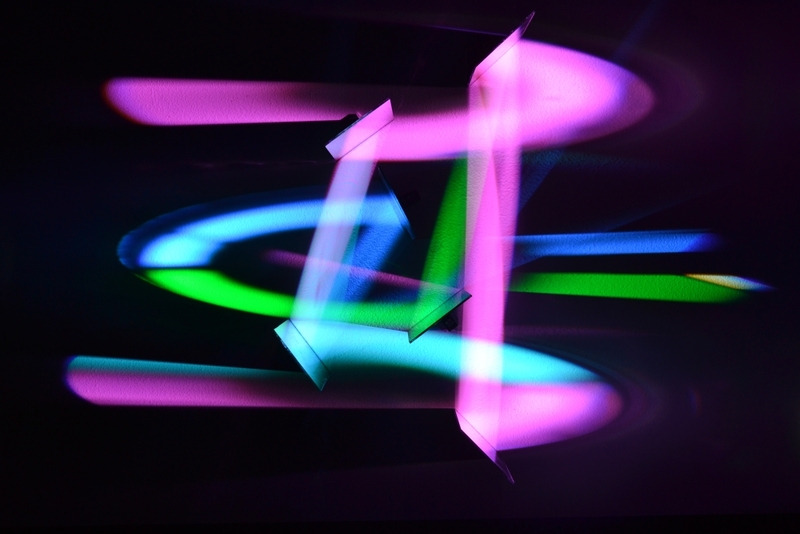 Three lights (LEDs under red, blue, and green gels) shine over a sequence of five nails, whose diffuse shadows make a kind of minimalist drawing. Three other light installations (or are they paintings?) show how an artist with a tight sense for composition can mine variations from just a few variables—in these works, lights and impediments. Bobo’s work is on view as part of CMD+F, a summer group show at Hemphill Fine Arts that also features work by James Huckenpahler and Rachel Schmidt. But Bobo’s work ought to get the room. That’s no knock against Huckenpahler or Schmidt. The former’s digital prints look like Andy Warhol portraits by way of a black mirror. The works could be inverted black-and-white photos that he’s then painted over with bright DayGlo colors. Huckenpahler’s pieces are anonymous infosec portraits that summon a sense of dread: Pop Art from the dark web. Schmidt’s piece is similarly foreboding. The installation takes the form of a series of low-slung icebergs along the ground. White lights underneath them pulse. A similar berg form hangs on the wall, over which the artist projects video clips depicting fairly innocuous scenes of urban life. The piece suggests, perhaps too literally, the seams coming apart around us. Huckenpahler and Schmidt are on the same page; Bobo’s work, while bold and edgy, comes from a different headspace. He would be a better fit alongside the work of Rockne Krebs, a late D.C. artist whose work Hemphill has shown in the past. With any luck, this is the first of more shows by Bobo to come.